Buy Oatmeal of Alford Gluten Free Oat Flour 500g in the UK from our online shop or directly from our independent Scottish store. Oat Flour can be used in many baking recipes as a gluten-free replacement for traditional wheat flour. Alford Gluten Free Oat products are a safe way to eat oats. Grown in sunny Aberdeenshire, Scotland and milled in the water-driven Montgarrie Mill, Alford Oat Flour is completely pure and free from wheat contamination. Alford gluten free Oat Flour can be used in many baking recipes as a gluten-free replacement for traditional wheat flour. These tasty pancakes are made with gluten free oat flour and Mheat streaky rashers. Suitable for a vegetarian diet. This recipe contains 150 g oat flour. We sell real Oatmeal of Alford and other Gluten Free Flours & Mixes directly from our shop in Scotland and online throughout the UK. View more products from Oatmeal of Alford. Where can you buy real Oat Flour - Gluten Free safely online? If you are wondering where you can buy Oatmeal of Alford Gluten Free Oat Flour 500g safely online in the UK, then shop with us. 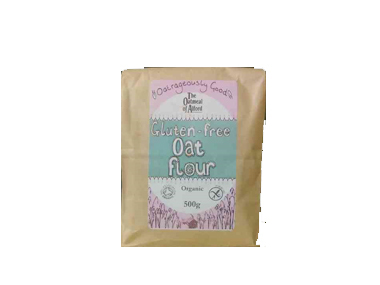 Oat Flour - Gluten Free - Oatmeal of Alford Gluten Free Oat Flour 500g in Gluten Free Flours & Mixes and Baking.